Yesterday we established that Betty is a Walkin' Woman. Today, we confirm that she is also a pioneer and a visionary. For is it not the visionaries among us that must go out and pave the way for others even though they themselves be scorned and ridiculed by the less informed? You see, I am a Nordic Walker. I walk with ski-like poles around a town which never sees snow. Let me tell you, people just can't seem to get over it. They stare, they back away, they stare some more. The more bold (I really mean "stupid" here) yell out things like "Headed for the snow?" or "Are you looking for the mountains? Man, do I get tired of it. Now, WHY do I walk with poles? OH. MY. GOSH. It is so much fun! I get out there, planting my poles and propelling myself down the sidewalk--it feels great. I really don't know why it feels great, but I am hooked on it like a lab monkey on cocaine. 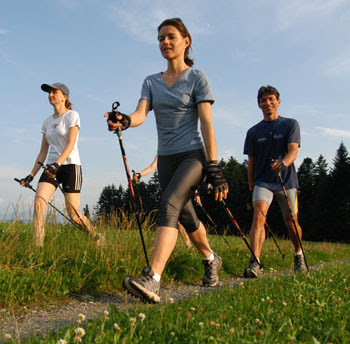 Nordic Walking burns at 480 calories an hour vs. 280 calories an hour with regular walking. Nordic Walking utilizes 90 percent of the body's muscles while walking. Nordic Walking strengthens the neck, arm and shoulder muscles. Increased rotation of the spine, less impact on knees and other joints, reduced back pain--all of these are benefits of Nordic Walking. I've tried to get my buddies to walk with me with poles. So far, only one has gotten hooked. The others back away and worry about how they'll look. Oh. Stop. It. Now, at one point, I thought I should dress up just a little for my sport. I felt I owed it to Nordic Walkers everywhere to look sharp when I was out and about with my poles. I bought some cool matching jogging outfits, but these days, I am more prone to wear my very comfortable high water sweats and my torn sweatshirt. Did I mention I wear my MBT's (funky looking sneakers) as well? The other day a math teacher and I were talking and he asked me if I watched "Modern Family." He then went on to describe a scene in which the dad of one of the families is describing his workout routine--walking with "special" shoes and poles. This teacher was laughing, telling me how hysterical this scene was. I was nodding and smiling and then I said, "You know I walk with poles and those same kind of shoes?" "Yeah, right! Good one!" he said, laughing, and nodding. "No, I really do!" I said. He laughed some more. Here's a clip from the show. The magic moment occurs around 1:30. This clip only sets my cause back about two years or so. Soon people will realize the wisdom of walking with poles. You can Google "Nordic Walking" and find all sorts of sites about it. (It's a huge sport in Europe.) My advice is: get yourself some good poles, learn the technique, and you'll be hooked too. Join the Betty Club and just try Nordic Walking. Before Nordic Walking I had neck and shoulder pain that plagued me night and day. Now, I have no problems with it. I've lost weight and gained arm muscles. I've gotten a raise at work, can now do complex mathematical equations, and my wrinkles have virtually disappeared. Did I mention I'm also very popular in my neighborhood? Although I have not tried the Nordic poles, I've heard that they are a FABULOUS work out and can add major calorie burn to a walking routine. Good for you! Also, Modern Family is my new FAVORITE show of the season! LOVE IT!! This guy, especially, is a HOOT! Way to go Betty! You make me want to work out now! BB, I would join you if we were in the same area. You can't argue with the benefits of a solid Nordic workout! Good for you! I think I need to start with getting off the couch. The poles might be a little too advanced for me at this point in my exercise career. *BTW my captcha that showed up is "noburn". Do you think the universe is mocking me for my laziness? I am having internet speed problems so I couldn't watch the video but that is OK, your post was funny itself! Why are people SO worried about how they "look"? In terms of being cool. (which already proves I am so Not cool because who still says that anyway? )A good example is my sister. I say do what makes you happy! Don't miss out on a thing life has to offer just because you might be afraid how you look doing it. Way to go Betty! Your neighbors could learn a thing or two from you! Wow. I'll be in Orange County tomorrow; might just pay a little visit to REI. I'm seriously gonna look into this. I wanna look fabulous and get muscles! Feeling like a monkey on cocaine will be just an added bonus. And there's no one around here to laugh at me. Sounds like a great workout! I need to get out and exercise more!! Loved the video! Guess I'll have to start watching that show. I think that the MBT's may be my destiny. They keep finding me! Thanks for sharing. Love your style and story telling ability. It is a poem that gives good ideas, thank you.